After beating us to the title in a close fought contest last season, AFC Fylde have returned to Aggborough and raided us again for one of our star players. Following in the footsteps of Jordan Tunnicliffe, after his departure to the quasi Blackpool club just over a week ago, today was the turn of Zaine Francis-Angol to pack his bucket and spade and head off for the windswept Irish Sea coast. With him out of contract there was nothing we could do about it and it looks likely that we'll also miss out on any compensation payments with Zaine not actually joining them until July 1st. ZFA joined us back in October 2015 after being without a club for a few months following his time at Motherwell. In his time with us he quickly became a firm favourite at full-back although there was once a rumour that he was going to join SV Hamburg during the close season last year. 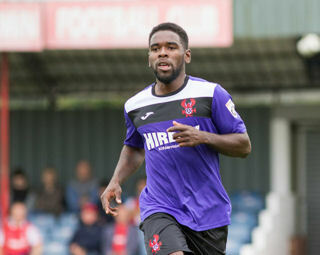 He has signed a two year contract at Fylde with the option of a third year if he so pleases. No doubt that contract is also a financially positive one and is something that we could not hope to match along with the lure at playing at a higher level. Although many might say that Zaine has joined a club well below his true level. We still have to see any players coming in to Aggborough and we might still see some more leaving yet. Elton N'Gwatala still hasn't signed his new contract and the longer it drags out the worse the fans fears get. Of course we all wish ZFA well at his new club but it's a worrying time for us to watch as the effects of not getting promotion begin to take place. And there's nothing we can do about it.